Malcolm Jenkins was almost traded for Brandin Cooks during the offseason. 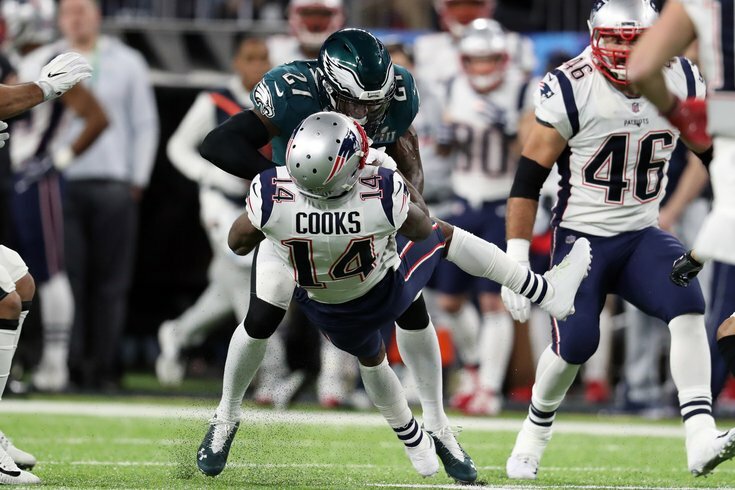 Jenkins almost ended Cooks in the Super Bowl. Now that the Philadelphia Eagles' offseason is (finally) underway, let's take a look at each position and figure out which players will be back in 2018, and which ones will be playing elsewhere. Here we'll look at safety. On the field, Jenkins was as versatile a defender as imaginable, as he played safety, slot corner, linebacker, and outside corner in 2017. Off the field, he was one of the leaders of the team. It's crazy to think that the Eagles actually considered including him in a package to acquire Brandin Cooks last offseason. Malcolm Jenkins: Stay or Go? Last offseason, the Eagles converted over $3 million of McLeod's salary into a bonus, thus creating immediate savings while spreading out his cap cost over the duration of his contract. Teams only do that with players they are willing to make long-term commitments to, so McLeod isn't going anywhere for years. Rodney McLeod: Stay or Go? Graham had some bad moments early in the season while playing hurt, most notably against the Chiefs, when Kareem Hunt made him look old. However, as the season progressed, Graham played well and was a valuable piece as a third safety. #JimmyVerdict: Like I said with LeGarrette Blount, I think the Eagles will wait until after the draft to decide on if they bring Graham back. If they select a safety or corner (with safety ability) reasonably early, I would lean against it. If not, I think they'd quickly move to re-sign him, if he hasn't already landed elsewhere. Graham should be back. It's just a matter of at what cost? I think the Eagles get something done there. Corey Graham: Stay or Go? According to Ian Rapoport on NFL Network, the Eagles decided not to tender Watkins as a restricted free agent. That was an easy decision, as doing so would have meant a $1.1 million raise. When Watkins had to play in 2017, he filled in capably, but is not worth the roughly $2 million that a restricted free agent tender would cost. The team could look to add Watkins back to the roster at something closer to the veteran minimum. #JimmyVerdict: Go, for now, but maybe re-sign at some point? Jaylen Watkins: Stay or Go? Maragos is one of the best special teams players in the NFL, but he'll be coming back from a serious knee injury. If the Eagles were to release Maragos, they would save $1.5 million. #JimmyVerdict: That's not out of the question, but I'd lean strongly toward Maragos returning in 2018. Chris Maragos: Stay or Go? Orange = They'll make it to camp, and will have to prove they belong on the roster.